From Aristotle and Thomas Aquinas, to Adam Smith and John Maynard Keynes, to the top economic thought leaders of today, The Economics Book is the essential reference for students and anyone else with an interest in how economies work. 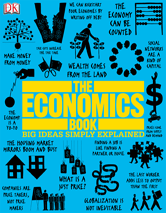 Easy-to-follow graphics, succinct quotations, and thoroughly accessible text throw light on the applications of economics, making them relatable through everyday examples and concerns. Employing DK's trademark visual approach, The Economics Book takes a frequently confusing subject and makes sense of it, clearly highlighting both historically important and emerging ideas in this critical field of science.